I’ve hit that point during the winter that I feel okay to say, “I’m over it.” I usually don’t mind winter but this year has been a bit strange- no snow and bitter cold, windy days intertwined with random 60˚ afternoons. If I at least had snow I could go snow shoeing or snowboarding (yes, there are ski hills in Illinois- note I said “hills”) Yet for the most part, I’d rather stay snuggled, tucked away under my blankets, dreaming of warmer spring days. I can feel the winter blues and I sometimes forget it is an actual thing. I feel tired all day, I cry at random things (like an NPR ted talk lunch hour tid-bit), and my eating habits have been less than stellar. 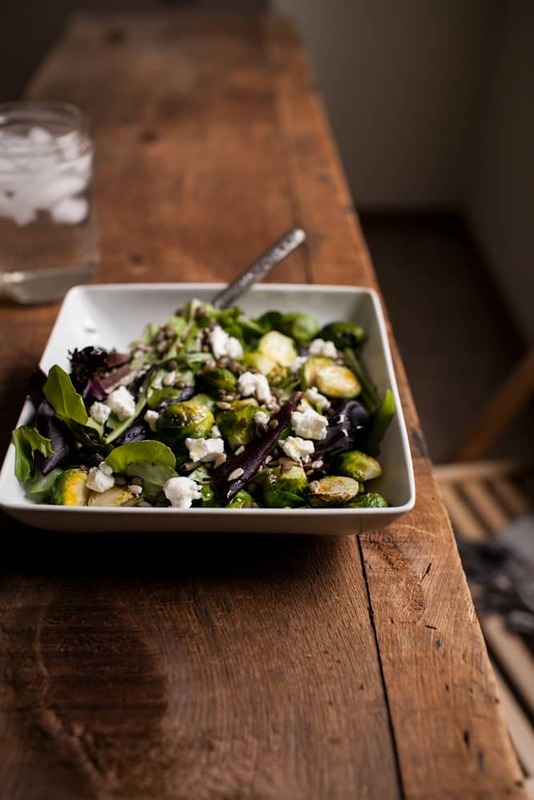 I’m craving a spring hike in the woods, a bit of sun on my face, and endless salads for lunch. While I can’t have sunny spring days, I can have salad. This salad was a bit of crapshoot if I’m being honest (of course, if I was really being honest, most of my meals are that way). Very rarely do I plan. My methodology is more of wandering into the kitchen, pulling out whatever random ingredients I bought at the store, and assembling them into some semblance of a meal. In this case, I was craving a big pile of green items: lettuce, Brussels Sprouts, and lentils. And then I remembered, it’s good to have love (and salads). Preheat oven to 400˚. 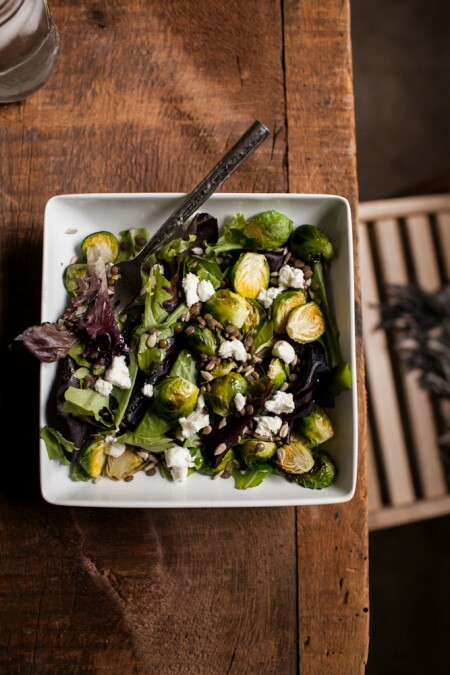 Cut off stems and slice Brussels Sprouts in half. Toss with 1/2 tablespoon olive oil and pinch of salt. Roast until tender and browned, 25-30 minutes. Rinse lentils and combine with water. Bring to a boil, reduce to a simmer, and cook until tende5; 25-35 minutes or until tender. Drain and rinse under cold water. 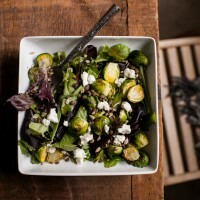 Assemble salad by tossing lettuce, lentils, goat cheese, sunflower seeds, and roasted Brussels Sprouts. Whisk together vinegar, olive oil, and lemon juice if using. Toss with salad. *I used Honey Wine Vinegar (that Becky was kind enough to share) and it was AMAZING! Of course, you can always use a good white wine or balsamic vinegar. Thank you for using and our Honey Wine Vinegar and we are certainly glad that you enjoyed it. Since you use so many vegetables in your site and your life, we hope our vinegar becomes a staple in your cupboard too. If you need to find a source for it, check out our web site, or give us a call. We would love to help! That’s an awesome combination 🙂 I think I may try that myself! Just made this tonite and loved it! It was filling but not heavy. Loved the addition of the sunflower seeds for a bit of crunch. Thanks for posting! Omg just made this for my lunch tomorrow and it came out amazing. Thanks for posting I can’t wait to try out more of your recipes! This was an awesome salad! Thank you! Lovely salad. 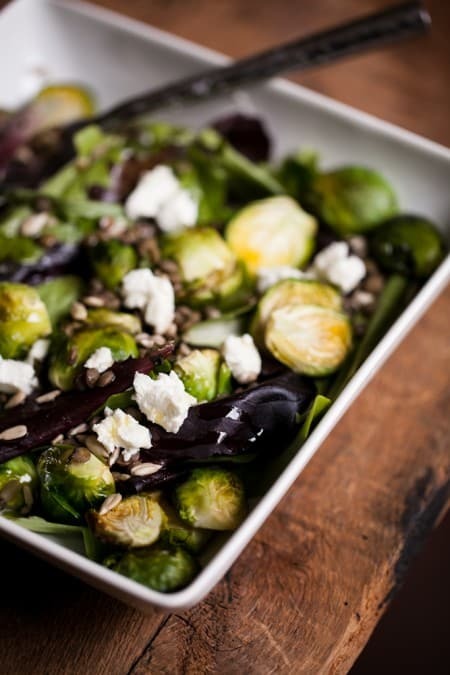 Living in Switzerland, often we only get what is in season and this week the market is crammed with Brussels Sprouts and not much else. Produce/food is very expensive and this salad, when paired with sautéd chicken tenders, made a filling and affordable meal. Thanks!